I don’t read Malay, but Alan Kelly has the following information on this disc on his CD-ROMs. It was recorded in Singapore. I don’t know what Qasim means, but for these early discs the performer was often just listed as the type of music or type of ensemble rather than the actual names of performers. Great find. It’s really cool you have this and are sharing it. Hello JW. The Jawi says: Lagu Burung Terbang Malam (that’s the title of the song, “Song of the Bird that Flies at Night”) / Qasim (the name of the male singer) / Pinang (where the singer came from; now spelt Penang). 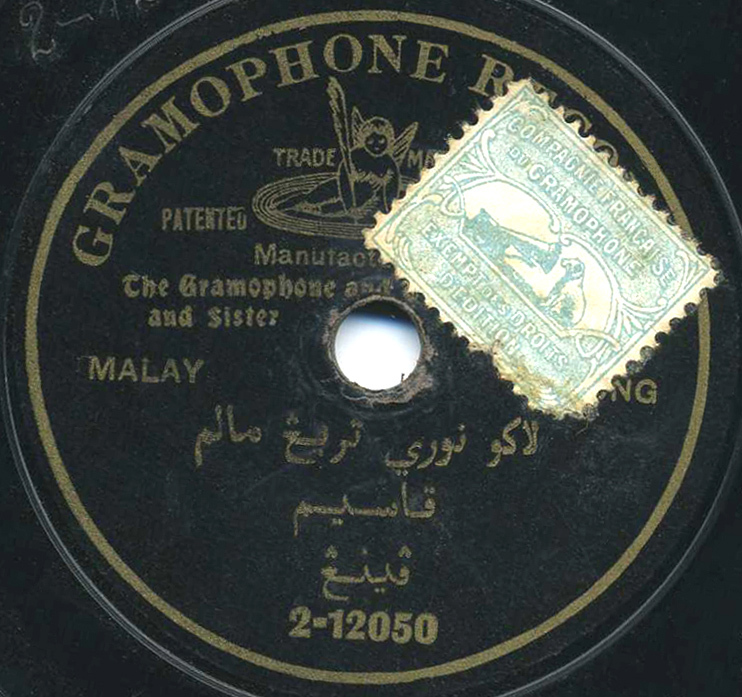 It was recorded in Singapore (not Penang) in May 1903, by, as you say, Gaisberg assisted by Dillnutt. Got anything else from Indonesia, Malaysia, or Singapore? I’m doing a discography of all 78s for that region before World War Two. oh, brother! a stunningly elevated performance. to whomever is working on a discography of the region, I have several dozen discs that may be useful. Hi JW, It a nice song, however the title according to the picture is “Lagu Nuri Terbang Malam” and not “Lagu Burung Terbang Malam”. Nuri is a parrot. What I’m understood, the song is talk about a man that begging for his lover to not to left him alone. May be I’m wrong coz some of the word is not clear. Lastly, it a good song. Is there other song from Malaysia, Singapore or Indonesia. Can’t wait to hear what next. Bye.